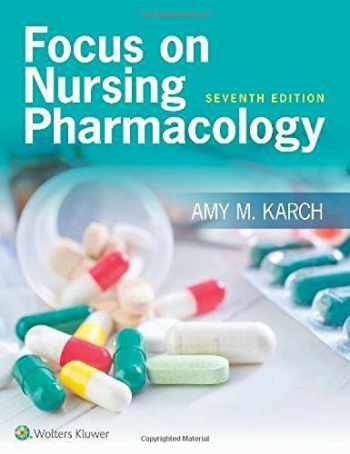 Acknowledged author Amy M. Karch wrote Focus on Nursing Pharmacology comprising 1070 pages back in 2016. Textbook and etextbook are published under ISBN 1496318218 and 9781496318213. Since then Focus on Nursing Pharmacology textbook received total rating of 3.5 stars and was available to sell back to BooksRun online for the top buyback price of $32.19 or rent at the marketplace. Help your students develop the knowledge they need to deliver safe, effective drug therapy.This proven resource reviews and integrates students’ baseline knowledge of physiology, pathophysiology, chemistry, and nursing fundamentals into chapters focused on “need to know” concepts about each group of drugs. Reflecting the most recent advances in the field, this concise and beautifully illustrated book organizes essential nursing pharmacology information into easy-to-learn steps.KEY FEATURES:A new Nursing Processes feature highlights the how-tos of planning patient-centered care.Coverage of 52 new drugs and 11 new drug classes brings the book completely up-to-date.Expanded Critical Thinking Scenarios present real-life scenarios that help students understand how assessment and the data collected are applied in clinical situations.Nursing Considerationssection s highlight the rationale for each nursing intervention to help students apply the information in practice.Drugs in Focustables clearly summarize and identify the drugs within a class, highlighting generic and trade names, usual dosage, and indications.Focus on Safe Medication Administrationboxes present vital information to help keep patients safe, prevent medication errors, and increase the therapeutic effectiveness of the drugs.Focus on Calculationsreviews help students hone calculation and measurement skills while learning about the drugs for which doses might need to be calculated.Focus on Drug Therapy Across the Lifespanboxes concisely summarize points to consider when using the drugs of each class with children, adults, and the elderly.Check Your Understandingsections present NCLEX-style questions, including alternate format questions, to help students prepare for the exam, as well as other questions and activities that reinforce concepts and aid in retention.Focus on Nursing Pharmacology, Seventh Edition, is also incorporated into Lippincott CoursePoint+ , a dynamic learning solution that integrates this book’s curriculum, adaptive learning tools, virtual simulations, real-time data reporting, and the latest evidence-based practice content together into one powerful student learning solution. Lippincott CoursePoint+ improves the nursing students’ critical thinking and clinical reasoning skills to prepare them for practice. Learn more at www.NursingEducationSuccess.com/CoursePoint.